The Clockwork Orange take to the field! So, Blood Bowl! 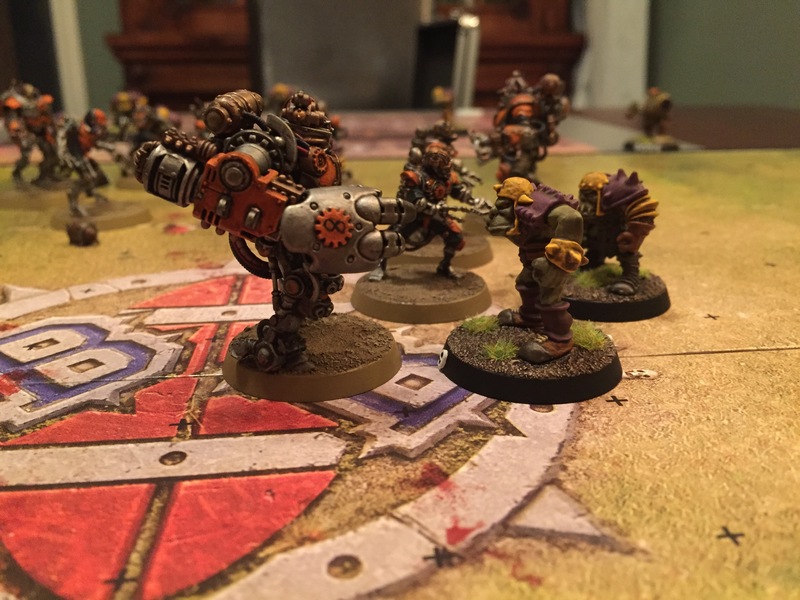 This was an exciting event because it was the first run-out for my Clockwork Orange team – in fact, this was my first game with undead, my first game with a painted side, and I scored my first touchdown! I am very much a novice at this game, having only played once before as an adult, but I feel that I am slowly getting the hang of it. That is a huge testament to my pal Ross and his patient, (and lenient), support! We played out a gruelling but enjoyable 1-1 draw, with Ross and his Orcs receiving the first kick-off and taking six turns to grind downfield for the first touchdown. That didn’t leave me much time to do anything in the first half, (other than crump some heads), so I had to wait for the second half to get my score on the board. I took the kick-off and caged my way down the field, before cutting loose with a speedy Ghoul. I managed my score in five turns, so that gave Ross a chance to come back at me in the last quarter. By this stage, he had a few players off the field, whereas I had been lucky with all my regenerate rolls and had a full team on the pitch. With a nice numerical advantage, I managed to stop his drive close to the half way line, knocked the ball loose and miraculously caught it. I just needed to hand the ball off to one of my speedsters to be in with a chance of pinching a late winning touchdown, and…. I fluffed the hand-off. Ultimately, a 1-1 draw felt about right – a late win would have been harsh on Ross, and the draw meant that the game was fun for both of us. LET’S GET READY TO FUMBLE! 1: Move the bloody turn counter FIRST Alex, you numpty! 2: Mummies are seriously and properly HARD! Rock-hard, like Tom Hardy Hard. 4: Regenerate is great – I was still at full strength at the end of the match! 6: Working through actions in order (most to least favourable) is key. Interesting read me old mate. I’ve never played BB but I like the models and concept. Sounds like you had a blast. I can’t wait to read the story man. Great stuff. I might have to finally finish off my 3rd Edition teams that I started many (many) moons ago. Keep up the inspirational BB posts! ;-) Thanks mate, I have a feeling that I’ll be playing a bit more BB over the coming months, so I’ll try and remember to take pics and report! 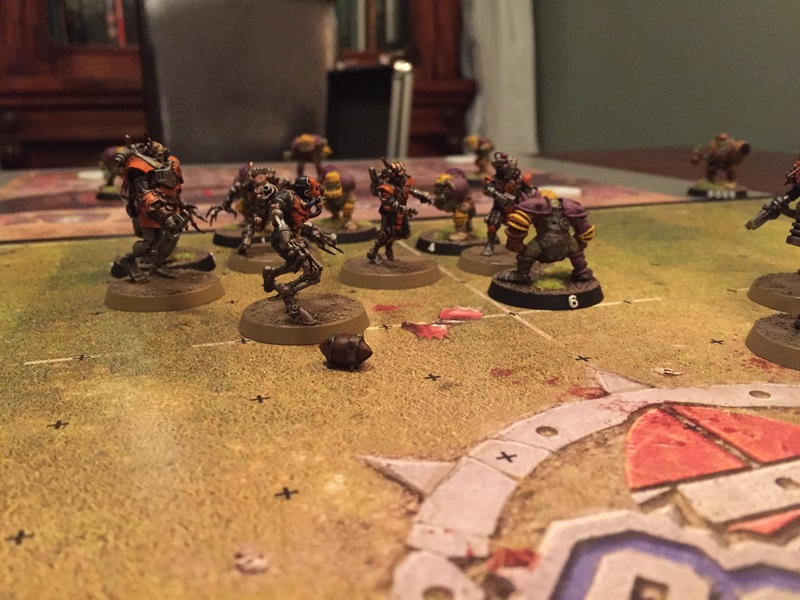 I’m getting back into Blood Bowl, since the re-release of the game last year. Finding it hard to find time to paint these days, but eventually I hope to get a team finished. The Undead were my longest running team, and I’d say the Wraiths are the best part about that team. Ghouls are great for scoring, but easy for your opponent to take own. You already mentioned most all of the basics, caging, tips, etc. I’d also say watch out for the sidelines. Coaches love to score a “crowd-surf” on lone players too close to the sideline.